DHS Assam Recruitment 2017 - 2018 notification for Grade IV, Paramedical Staff & Staff Nurse jobs under Director of Health Services Assam advertisement 2017. Applications are invited from eligible candidates for 328 nos of Gr- IV posts in 47 Nos. of newly created Model Hospitals of the District level in the State. Pay Scale: PB -1, Rs. 12000/- – Rs.37500/- + Rs.3900 Grade Pay. Qualification: The Candidate should be VIII passed. Age: Candidate must not be less than 18 years and more than 43 years as on 1st January 2017. The upper age limit is relaxable by 5 years for SC/ST candidates. Pay Scale: PB-1, Rs. 12000/- – Rs.37500/- + Rs.3900 Grade Pay. Assam Health Department Recruitment 2017-18 Paramedical Staff 216 Nos. Online applications are invited to the following paramedical staff posts in 47 nos. of newly cheated Model Hospitals of the State under the establishment of the Directorate of Health Services Assam. Pay Scale: PB-2, Rs. 14,000/- to Rs.49,000/-+ GP Rs.6200. Qualification: Radiographer Technician Certificate Course or above from any Govt, recognized Institute of Govt, of Assam. Qualification: Laboratory Technician Certificate Course or above from any Govt, recognized Institute of Govt, of Assam. Qualification: Graduate in any discipline from recognized university with the certificate of computer application. Qualification: HSLC or equivalent passed from a recognized Board with experience. Reservation: Reservation of posts for SC / ST (P) / ST (H) / OBC (MOBC) / Women candidates and Physically Handicapped candidates will be as per prevailing Government Rules. Age: Candidate should not be less than 18 years and not above 43 years as on 01.01.2017. The upper age limit is relaxable by 5 years for SC, ST (P), STH candidates only. Assam Health Services Recruitment 2017- 2018 STAFF NURSE jobs 832 Nos. Joint Director of Health Services of the districts and Medical Colleges & Hospitals invited online application for the recruitment of 500 Staff Nurse Vacancies. Qualification: Candidates must have passed GNM/B.Sc. Nursing Course from a Govt. recognized Institute, and have registered with the Assam Nurses, Midwives’ and Health Visitors Council. Age limit: Candidate should not be less than 18 years and not above 43 years as on 01.01.2017.The upper age limit is relaxable by 5 years for SC, STP, STH Candidates only. * Interested and eligible candidates for GRADE IV POSTS can apply in the prescribed standard form of application along with photocopies of all testimonials (self attested) regarding qualification, age, caste, employment exchange registration card, Caste certificate (in case of reserved category candidates), Disability Certificate (in case of Person with Disabilities) issued by competent authority, Original Treasury Challan, copy of BPL certificate in case of candidates of BPL families and two recent passport size photograph of the candidate with his /her signature at the top. The self-addressed envelope of 10’x4.5' affixing postal stamp of Rs.5/- must be enclosed with the application should be reached the following given address within time. ''To, the Jt. Director of Health Services of the District''. Application Fee PARAMEDICAL STAFF Posts: The application fee of Rs.250/- only for General Category candidates and Rs.150/-(Rupees One hundred fifty) only for OBC/MOBC, SC,ST(P) & ST(H) Category candidates will have to be paid through Treasury Challan to the Head of Account “02 10-m&ph- 01-Urban Health Services-800-Other Receipt" and the scanned copy of the challan to be uploaded while submitted the online application form. No fee is required for BPL candidate and they are required to upload their BPL certificate from the competent authority for such exemption fee along with the application. (a) 02 (two) Copies of recent passport size color photograph duly self-attested. (c) All mark sheets and pass certificate. Application Fee STAFF NURES Posts: The application fee of Rs. 250/- only for General Category Candidates and Rs.150/- (Rupees One hundred fifty) only for OBC/MOBC, SC, ST(P) & ST(H) category candidates will have to be paid through Treasury Challan to the Head of Account “0210-M&PH-01-Urban Health Services-800-Other Receipts” and the scanned copy of the challan to be uploaded while submitting the online application form. No fee is required for BPL candidate and they are required to upload their BPL certificate from the competent authority for such exemption fee along with the application. * Interested and eligible STAFF NURES candidates shall have to fill up the online Application Forms available at the official website of Directorate of Health Services Assam (www.dhs.assam.gov.in). (a) 2 Copies of recent passport size color photograph duly self-attested. (g) Nursing Registration Certificate authenticated by Registrar, Assam Nursing Council. * Last Date extended to Grade IV posts: 03-01-2018 12-01-2018. * Last Date extended to PARAMEDICAL STAFF posts: 10-01-2018 12-01-2018. * Last Date extended STAFF NURES post: 06-01-2018. Grade IV posts Recruitment details. Advertisement details and Online application form for PARAMEDICAL STAFF. Advertisement details and Online application form for STAFF NURES. 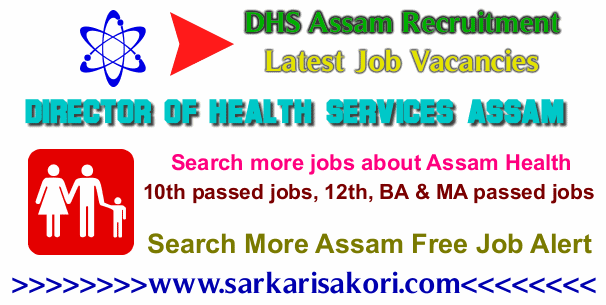 You will be interested more jobs about DHS Assam Recruitment, Director of Health Services Assam.